As a community of believers our mission is to love God more than anything else, to share the love of our Savior to our neighbors, and to develop disciples and equip them for service so that the body of Christ grows in unity in faith and in knowledge of Jesus, the Son of God. 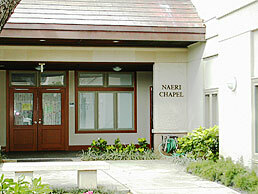 The English-speaking Ministry of Christ United Methodist Church is a multi-cultural, multi-generational congregation which is part of a larger Korean-speaking church in the neighborhood of Makiki. Christ United Methodist Church is located on the corner of Keeaumoku St. and Heulu St. More parking is available on Sunday mornings further up Keeaumoku St. (towards to mountain) at Catholic Charities, on the corner of Keeaumoku St. and Nehoa St.
Pastor In Kwon Jun was born in Kanghwa, South Korea, on November 26, 1984, into an amazing pastor family and vibrant church. After growing up on hearty motherland cuisine, culture, and community, Pastor In Kwon followed his parents' call to be missionaries in the Dominican Republic at the age of nine in 1993. In the Dominican Republic, Pastor In Kwon welded his heart with the passionate heat of the Caribbean sun and the generous warmth of the Dominican people. At his core, Pastor In Kwon moves to the rhythm of their latino dance and culture. He graduated as Class of 2002 from Santiago Christian School, and moved to the U.S.A. to attend Gordon College in Wenham, MA. There in the deep snows of winter, Pastor In Kwon enriched his faith and knowledge of God. In 2006, he graduated with Bachelor of the Arts degree in Biblical and Theological Studies, and went on to Wesley Theological Seminary in Washington, DC. In seminary, Pastor In Kwon had the opportunity to serve at National Korean UMC in Rockville, MD as the youth and children pastor for four years. Then in the summer of 2010, after receiving his Masters of Divinity degree, he served the Korean UMC of Greater Washington in McLean, VA as the worship leader for the English Ministry, and the college and young adults pastor. 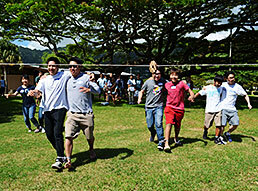 After two years, Pastor In Kwon felt God's leading and calling to move to Hawaii to be the full-time youth pastor at Aiea Korean UMC (AKUMC). From July 2012 to June 2017, as he served AKUMC in various aspects of ministry, Pastor In Kwon grew in Christ and grew to love the unique and most special place that is Hawaii and its beautiful multicultural people. Above all, on January 7, 2017, Pastor In Kwon experienced his second being born-again experience when he married Debora Her, and his world was changed all for the better. Pastor In Kwon's wife Debora was born and raised in Busan, South Korea, as the second among four siblings in her family, and spent most of her life playing piano at her father's church (http://onnurimission.org/). She graduated from Kosin University on August 2016 with a Master's Degree in Music and Piano Performance, and today, she is learning English and being blessed in God's ohana and the aloha of Hawaii. Pastor In Kwon looks forward to starting a family soon, as he begins ministry with a new church family at the English Ministry of Christ United Methodist Church. Filled with hope, faith and love, Pastor In Kwon expects God to do amazing works for His glory, as the Holy Spirit makes His Church beautiful and powerful from Christ UMC to the ends of the earth. Amen.